Map showing the location of the seismic line below in relation to major structural features in the region. The Mediterranean Ridge and its backstop constitute a huge structural feature several hundred kilometres long. The structural style is not homogeneous along strike. The region was affected by thrust and strike-slip faults, activated after the collision of the African and Eurasian plates, and the resulting complex tectonics make 2D seismic interpretation difficult and often questionable. However, the new PSDM high quality seismic data acquired by PGS show that the tectonic complexity in the region is manifested by three different pull-apart basins, which have been created since the early Miocene. These basins were filled with mixed siliciclastic (flysch sediments) and slope carbonate deposits, both of which could be excellent reservoirs. Interpreted 2D PSDM seismic line showing the key identified unconformities, which correspond to main tectonostratigraphic events. The underexplored deep waters of the east Mediterranean are ready to be investigated! Until recent years, technological constraints have limited the possibility of exploring in frontier deepwater environments, especially in the Mediterranean Sea. However, the petroleum industry has now begun to show considerably more interest in investigating these waters, particularly following recent discoveries in the Eastern Mediterranean, such as Zohr, Leviathan, Tamar, Aphrodite and Calypso. Greece’s blocks and wells. Hydrocarbon exploration in Greece dates back to the beginning of the 20th century, but activities were carried out in a rather sporadic and unsystematic way until the 1960s and were mainly focused on onshore areas, characterised by surface oil shows, especially in western Greece. It was not until the 1970s that things changed with the discovery of the Prinos and South Kavala fields, which remain the only currently producing fields in the country. However, very little was done with regard to exploration activity offshore, even following the discovery of the Katakolon field in the western Peloponnese in the early 1980s, until 2012 when an Open Door invitation was launched. Since then, Greek E&P potential has attracted growing interest, with a number of major companies being awarded licences in 2018, including Total, Exxon-Mobil, Repsol and Edison. Carbonate build-up near Gavdos Island, which lies about 30 km south of Crete. 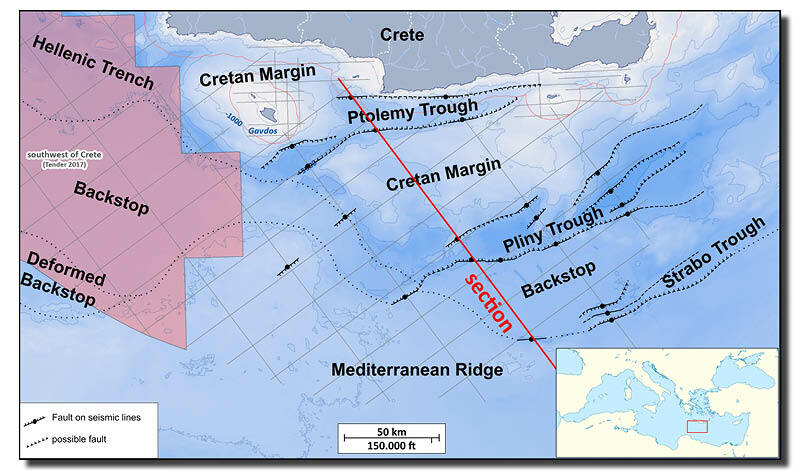 With the exception of hydrocarbon production in the northern Aegean Sea from the Prinos and South Kavala fields, exploration activity today is focused on the Ionian Sea and the offshore frontier areas south of Crete, as well as a number of onshore areas in western Greece. The Thrust-Fold-Belt (TBT) province of western Greece is believed to be an analogue of the proven hydrocarbon provinces in Albania and Italy. Block Ioannina (on the border with Albania), in particular, lies on trend with the Shpirag discovery in Albania. The hydrocarbon potential targeted in the Ionian Sea geological province is mainly contained within carbonate reservoirs, as well as in the clastic series present there. 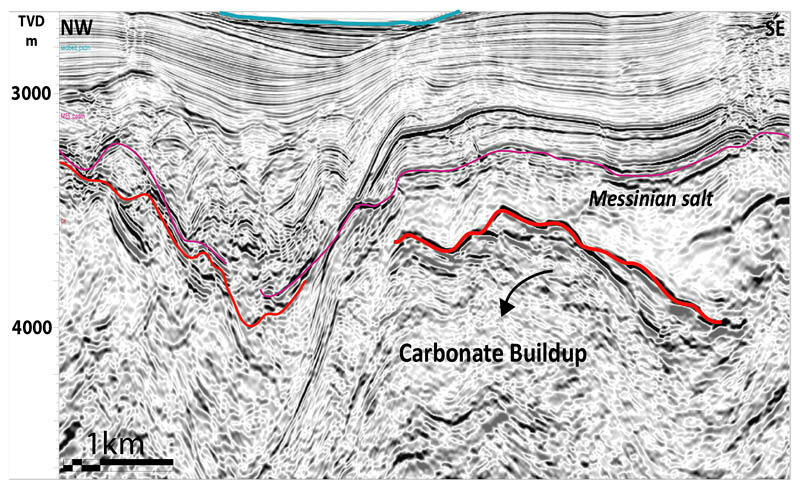 Abundant carbonate build-ups and calci-turbidites are the main potential drilling targets for the oil and gas companies active in these blocks. On the other hand, the offshore areas covering the west of Crete and blocks south-west of the island, as well as the open acreage south of Crete, are frontier regions with very little exploration history. Zohr analogues seem to be the main target for the companies active here. As a result of the active compressional tectonics, Greece is primarily a mountainous country, with more than 300 mountains, about 40 of which exceed elevations of 2,000m. It is also characterised by deep sea waters, which reach depths of over 3,500m. The blocks offered for offshore exploration lie in areas with water depths ranging from a few hundred metres to 3,500m. Clearly, this is not an easy environment for oil companies to work in. However, the industry’s deep sea technology is already well developed and successfully tested; an exploration well in very deep water (3,400m, Total’s Raya-1 well in Uruguay) is a part of the drilling trend in worldwide exploration. The Greek E&P industry timing could be considered quite advantageous, as the initial wells in the country in these ultra-deepwater settings are likely to be spudded at the end of the first or the second exploration phase in the majority of the concessions. That should result in drilling activity some time around 2024–2025, which should coincide perfectly with the technological advancements. Therefore, besides the economic benefits, Greece will be placed in the centre of deep sea drilling innovation, and will provide an environment for new technologies to be applied. Equally important is the fact that regulations governing deepwater activities will be in place at the same time. At the moment legislation throughout the world does not really cover such environments, but it is also true that the majority of lawmaking bodies worldwide are currently working intensely on issues such as the safety of offshore installations. The major pipeline projects in the area are the Trans-Adriatic Pipeline (red), the Trans- Anatolian Pipeline (orange) and the East Med pipeline (red arrows), this last currently under discussion. Greece is located in the south-eastern part of Europe and this location works in its favour. The country already has a number of local pipelines in place but, most importantly, major projects are currently either under construction or in the pre-development stage. 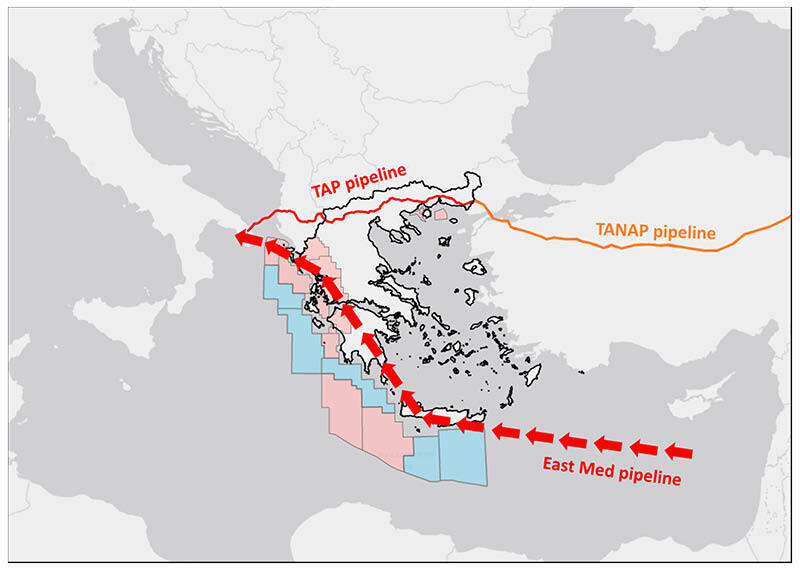 The Trans-Adriatic Pipeline (TAP), which is being built at the moment, will run across northern Greece and Albania to connect with the Italian pipeline network. To the east it will be connected at the Greece-Turkey border with the Trans-Anatolian Pipeline (TANAP). Its purpose is to bring gas from the Caspian area to western Europe, forming part of the Southern Gas Corridor. The second major pipeline project is the East Med pipeline, which is currently under discussion. It will connect the offshore gas reserves from Cyprus and Israel in the Levantine Basin to Greece and on into Italy via an interconnector. It is designed to initially transport 10 Bcm a year. Greece’s state oil and gas company, HHRM SA (Hellenic Hydrocarbon Resources Management SA), to date has evaluated and approved over 100,000 km2 of exploration acreage. Given that E&P activities require long-term investments in order to contribute to a country’s economic growth and competitiveness, the company has already acknowledged the fact that, in the near future, Greece will require a specialised and highly skilled workforce able to operate in the manner of international oil companies. Some recommended GEO ExPro reading of previous articles relating to hydrocarbon and resource exploration in Greece. 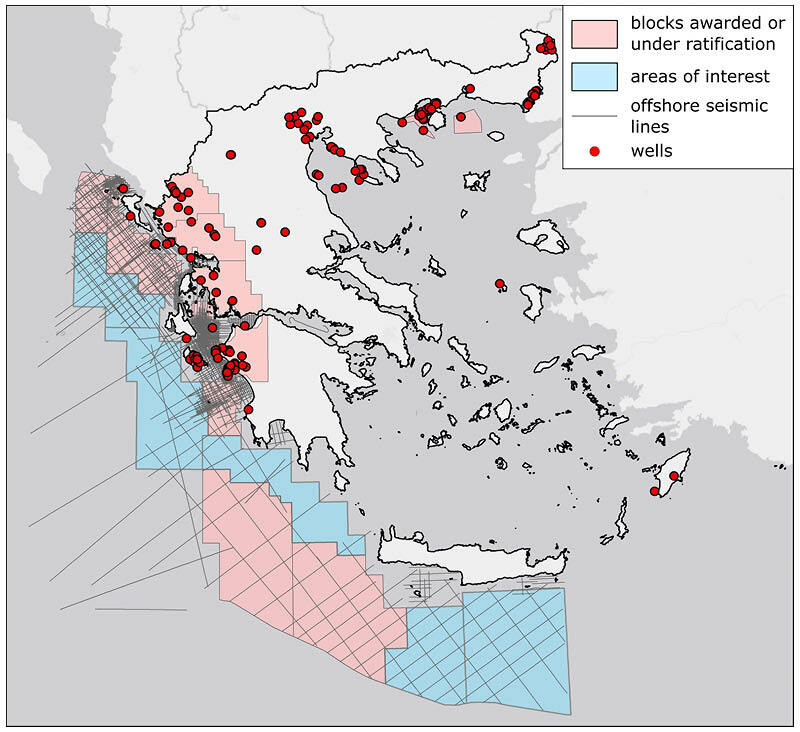 Newly processed seismic will uncover hydrocarbon resources hidden offshore Greece. By assembling and merging a fragmented dataset of 3D seismic, it is possible to release the hydrocarbon potential of the Norwegian Continental Shelf.